Mentioned is the way you can write Hospital Dietician Nutritionist CV Templates. People looking for jobs can easily download these Hospital Dietician Nutritionist CV Templates in word or pdf format or just view it online to copy and paste. Cover letter of Hospital Dietician Nutritionist CV Templates is also available. 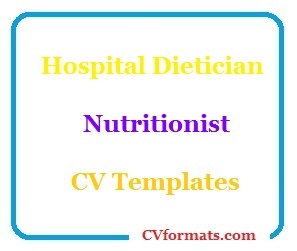 Just change the name , address , qualification and experience and your Hospital Dietician Nutritionist CV Templates is ready. I am a dedicated and qualified dietitian/nutritionist with three years experience offering dietary advice in a retail setting. I’m seeking to develop my skills in a new role to help people develop healthier diets and lifestyles. I’m a positive and professional person who loves helping people look and feel the best they possibly can.